Kenny Harries was a clarinet player who was popular on WIBW and the old Kansas Round-Up in Topeka, Kansas back in the 1940s and 1950s. He was actually a native of Topeka, though both of his parents were born in Iowa. His dad was of Scotch-Irish heritage while his mom was Danish. He had a sister who was married at the time in the late 1940s. Ken said he didn't do much in his early childhood except bang away on a piano - just to hear the 'noise'. Then he said, he began his 'career' by 'deafening everyone' when he began to play the harmonica. But later he was good enough to play at school functions. Finally, he got his parents to let him take piano lessons. From there, he decided he wanted to learn another instrument, this time the clarinet. And in junior high, he was playing in the school band and later in the high school band. His clarinet instructor, who later became a member of the Barnum and Bailey circus band, encouraged him to take up the saxophone. Then things happened for him in the summer vacation of 1943. He got a chance with the Jack Cole Orchestra in Omaha, Nebraska and toured with them a few weeks. Then like another WIBW member, hooked up with another band leader of the day, Ted Fio Rito and toured with them the rest of the summer, going to places in Iowa, Nebraska, Missouri, Wisconsin, Minnesota, Illinois and South Dakota, playing all sorts of ballroom and theater venues. When he came back home, he finished school, then joined the U.S. Navy in July 1944. Later that same year, he came home on leave and married his childhood sweetheart, Jo Ann Dyal. When he returned from leave, he was assigned to the Navy Conservatory of Music located in Washington, DC. From there, he was sent to work with Admiral Chester Nimitz's band, based in Guam. 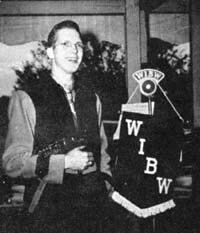 He wanted to continue his career in music, so when he left the military service in March 1946, he applied for and got a job at WIBW. He and his wife had a daughter named Nancy Jo in June of 1947.